The ESA’s Mars Express orbiter has spotted a funny cloud on Mars, right near the Arsia Mons Volcano. At first glance it looks like a plume coming out of the volcano. But it’s formation is not related to any internal activity in this long-dead volcano. It’s a cloud of water ice known as an orographic or lee cloud. The cloud isn’t linked to any volcanic activity, but its formation is associated with the form and altitude of Arsia Mons. Arsia Mons is a dormant volcano, with scientists putting its last eruptive activity at 10 mya. This isn’t the first time this type of cloud has been seen hovering around Arsia Mons. Mars has an extensive network of ancient valleys that were likely carved out by water over geologic time periods. Now a new study suggests that Mars had much more water than previously thought, and the key behind calculating that amount of water is in the valleys themselves. The issue of exactly how much liquid water Mars had on its surface has been a hotly debated topic. There’s ample evidence that there was liquid water there. Orbiters and rovers have provided most of that evidence. Sedimentary rock, hydrated minerals that only form in the presence of water, and the obvious valleys, lake basins, and deltas all show that Mars was once a world with large quantities liquid water. But to find out how much water there was in Mars’ past, we have to go beyond what we can see with our orbiters and rovers and construct models. That’s exactly what Northern Illinois University geography professor Wei Luo and his colleagues Xuezhi Cang & Alan D. Howard did. To do this, they relied on what previous studies have found, what we know about erosion and water cycles here on Earth, and on an innovative new algorithm that calculated the volume of Mars’ valleys, and how much water would be required to excavate them. Their new estimate of Martian water volume is 4,000 times the volume of the valley cavities on Mars. 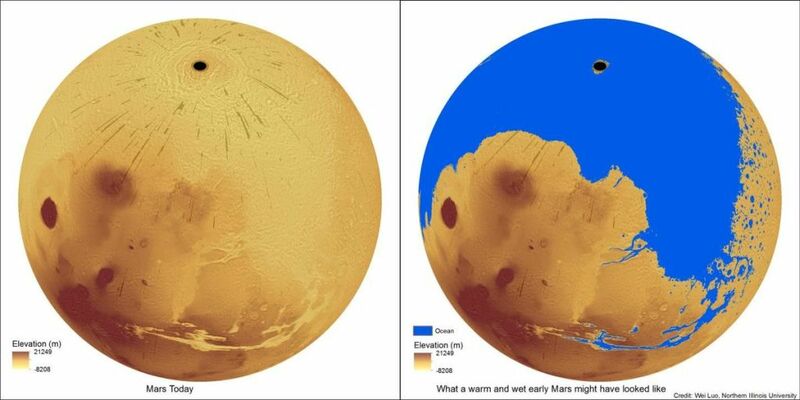 This means that Mars would have had an active water cycle much like Earth does. Water would have moved from the lakes and oceans through the atmosphere and over the surface via evaporation and precipitation. As the authors write in their paper, “Without an ocean-sized open body of water, it would be hard to imagine the high rate of water cycling suggested by our new estimates.” So where does that leave us? Some of the largest features on Mars, like the huge Valles Marineris, might have formed as a tectonic crack, which was then further enlarged by erosion. For other valleys, a lot of other causes have been proposed for their formation, including glaciation, and erosion by CO2, lava, and even wind. It’s clear that at some point in the past, Mars had liquid water. How much water exactly is a hotly-debated topic, and this study won’t end that debate. But this study used much higher-resolution techniques, perfected in terrestrial uses, to arrive at its estimates. This study was also conducted globally on Mars, rather than by sampling individual locations. It will affect the debate in some way. As they say in their paper, “There is no ground truth to assess the real accuracy of our estimation.” There’s really no way for scientists to reach a conclusion yet about the size of Martian oceans in the past, and on how active the hydrological cycle might have been on that planet. For now, we can let the debate continue. In 2006, the International Astronomical Union (IAU) changed the definition of what a planet is. Pluto’s demotion stemmed from discoveries in the 1990’s showing that it is actually a Kuiper Belt Object (KBO). It was just the first KBO that we discovered. When Pluto was discovered by Clyde Tombaugh in 1930, and included as the ninth planet in our Solar System, we didn’t know much about the Kuiper Belt. But in 2005, the dwarf planet Eris was discovered. It was like Pluto, but 27% more massive. This begged the question, Why Pluto and not Eris? The IAU struck a committee to look into how planets should be defined. In 2006, the IAU had a decision to make. Either expand the definition of what is and what is not a planet to include Eris and other bodies like Ceres, or shrink the definition to omit Pluto. Pluto was demoted, and that’s the way it’s been for a decade. Just enough time to re-write text books. But a lot has happened since then. The change to the definition of planet was hotly debated, and for some, the change should never have happened. Since the New Horizons mission arrived at Pluto, that debate has been re-opened. A group of scientists led by Runyon has written a paper to be presented at the upcoming Lunar and Planetary Science Conference on March 20th to 24th. “A planet is a sub-stellar mass body that has never undergone nuclear fusion…” – part of the new planetary definition proposed by Runyon and his team. Emphasizes intrinsic as opposed to extrinsic properties. The geophysical definition is already in use, taught, and included in planetological glossaries. There’s no need to memorize all 110 planets. Teach the Solar Systems zones and why different planet types formed at different distances from the Sun. Their proposal makes a lot of sense, but there will be people opposed to it. 110 planets is quite a change, and the new definition is a real mouthful. “They want Pluto to be a planet because they want to be flying to a planet.” – Prof. Mike Brown, from a BBC interview, July 2015. Saying that the team behind New Horizons find Pluto’s status emotionally difficult seems pretty in-scientific. In fact, their proposed new definition seems very scientific. There may be an answer to all of this. The term “classical planets” might be of some use. That term could include our 9 familiar planets, the knowledge of which guided much of our understanding and exploration of the Solar System. But it’s a fact of science that as our understanding of something grows more detailed, our language around it has to evolve to accommodate. Look at the term planetary nebula—still in use long after we know they have nothing to do with planets—and how much confusion it causes. “It is official without IAU approval, partly via usage.” – Runyon and team, on their new definition. It may seem pointless to flip-flop back and forth about Pluto’s status as a planet. But there are sound reasons for updating definitions based on our growing knowledge. We’ll have to wait and see if the IAU agrees with that, and whether or not they adopt this new definition, and the >100 planet Solar System. You can view Runyon and team’s poster here. You can view Emily Lakdawalla’s image of round objects in our Solar System here. You can read the IAU’s definition of a planet here.